Family Leave Affects Whether Someone Can Die At Home : Shots - Health News A lot of things can affect whether a person can die at home as wished rather than in a hospital. One is whether a relative is able to take more than a few days off work to care for them. When a family member of mine was dying of cancer, her husband's boss told him to take all the time he needed to care for her. She was granted her wish of being at home when she left this earth, surrounded by those she loved most. 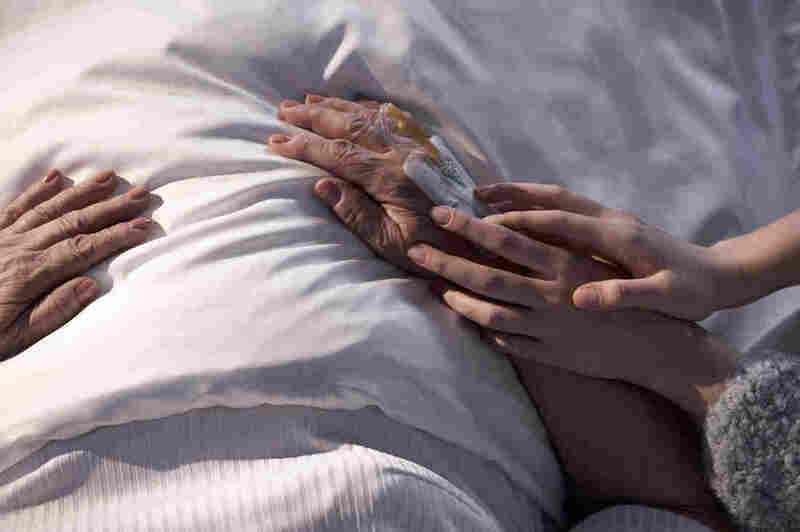 But a wide base of support is needed in order for a patient's wish to die at home to be made real — including, in some cases, whether someone can take time off work to be with their loved one in their final days, a study finds. The study, which was published in BMC Medicine on Thursday, looked at the deaths of more than 350 cancer patients in London. Using feedback from those patients' loved ones, researchers found that four factors could explain 91 percent of deaths that occurred at home: patient's preference, relative's preference, home palliative care or district/community nursing. Having a comprehensive home-care plan in place is crucial, says lead author Barbara Gomes, a research fellow at the Cicely Saunders Institute of Palliative Care, Policy & Rehabilitation at King's College London. That should include specialist palliative care services and the availability of around-the-clock nursing. The number of home doctor visits also increased a patient's chances of dying at home. But researchers also identified three factors that had been previously overlooked yet still weighed into whether a patient died at home: the length of time in which the family knew the patient's illness was incurable; discussion of the patient's preference with family; and the number of days family members took off work in the three months before the patient's death. There are a variety of possible explanations for the connection between relatives' days off work and a loved one's at-home death, but Gomes is careful to point out that this retrospective, observational study can't draw a cause and effect on this point. Bolotsky argues for providing paid family leave to all employees, as he did recently in an op-ed in support of the New York bill. "For most of us, nothing is more important than our families," he says. "The folks who raised us ought to be able to have a dignified passing, and being able to be there with your loved ones is really important." The British study also found that dying at home was more peaceful for the patient and led to less grief among their loved ones. And the people who died at home didn't experience more pain than those who were in a hospital.